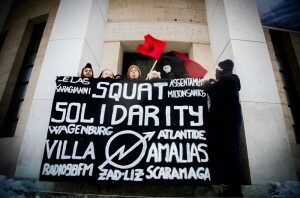 On the January 17th a spontaneous demonstration in solidarity with the squats in Athens took place in the streets of Berlin-Kreuzberg. At 8 pm around 50 people gathered to show their solidarity with Villa Amalias, Skaramanga and Lelas Karagianis, walking through the main street of Kreuzberg. 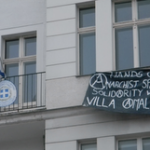 • On five houses and social centres banners were placed with solidarity messages for Villa Amalias and later also the other squats. • Anarchist poster-newspaper ‘Zwart behang’ appeared on the 18th of January with a text on the recent developments in Greece, calling out for solidarity. 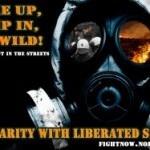 “We call for a worldwide campaign of direct actions in solidarity with liberated spaces from the 2nd to the 12th of February 2013. The city now aims to cancel the usage contract for the building and treatens with violent eviction – in order to construct a park. WTF?! That we won’t let happen. Expect resistance. 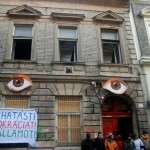 On the 19th January 2013, homeless activists and their allies squatted an empty building in the 7th district of Budapest. 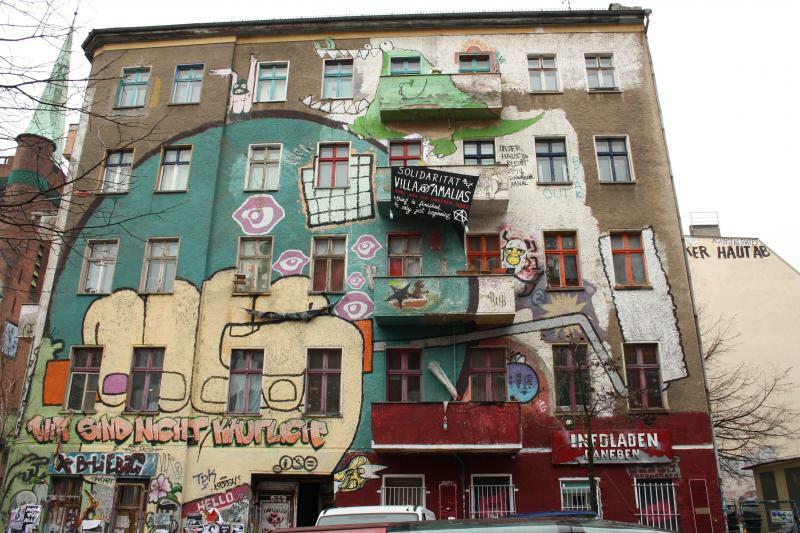 The squatters demanded the institutionalization of a right to housing and an extensive system of social housing instead of punitive measures and overcrowded shelters. The activists were arrested and now face misdemeanor charges because of disobeying police instructions. Saturday January 19th 2013, Solidarity action took place in Zagreb in support of these spaces: Villa Amalias, Skaramanga, Radio 98FM (Greece), SJZ, LIZ (Germany), the ZAD (France) and the Assentamento Milton Santos (Brazil). Wagenburg Atlantide. DIFFERENT PLACES – SAME BATTLE! 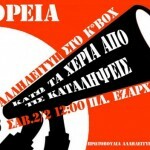 Stop threats, fascist attacks and evictions! 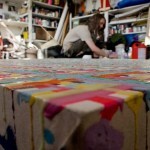 On January 14th, 2013, the 491 Gallery closed its doors for the final time. It is now in the possession of its new owners, who intend to demolish it and build a generic block of flats. Its sister building, Vertigo, will remain. The contents of the community garden are currently subject to a preservation order, and are being transferred to a new community garden on the other side of the railway bridge. In the early hours of January 16th 2013 we found a suitable canvas to express our rage and solidarity with the recent wave of attacks on anarchist/autonomous spaces in Greece. 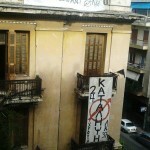 On January 15th, at about 12.00pm, cops raided Greece’s oldest anarchist squat, Lelas Karagianni 37. 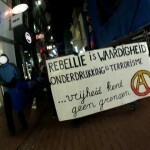 Solidarians and neighbours gathered at Amerikis square and then outside the squat, trying to prevent the eviction. There were several comrades on the rooftop of the building chanting slogans, who were caught by the police. Also, two solidarians were beaten by cops on the street and detained as well. 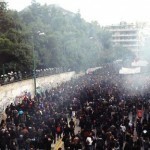 Heavy repressive forces were deployed downtown, plus a police helicopter. 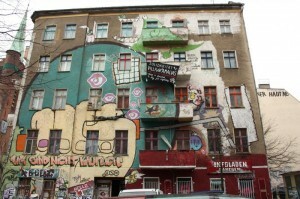 Soon thereafter, more people were assembled near the evicted squat. 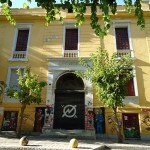 A gathering was called for 15.00pm outside the police headquarters on Alexandras Avenue, in solidarity with the 14 squatters who were arrested from inside Lelas Karagianni, and a discussion was announced for 19.00pm in the Athens Polytechnic (entrance from Stournari street). Timeline from Contra Info, see Athens Indymedia for pictures from solidarity demo that reached the area of Evelpidon courts. [15.36pm] Since the morning of January 12th, few hours before a large solidarity demo took place in downtown Athens, the 92 arrestees from the re-occupation of Villa Amalias were brought before an interrogating judge in the Evelpidon courthouse. Approximately 25 comrades have been released so far, without monetary bail but under the restrictive term to sign up at a police station once a month. The court proceeding will be long.